The holiday season is approaching, and with it, ample opportunities to market the eyewear we sell. Here are four holiday promotions that we find build end-of-year sales and raise patient satisfaction. 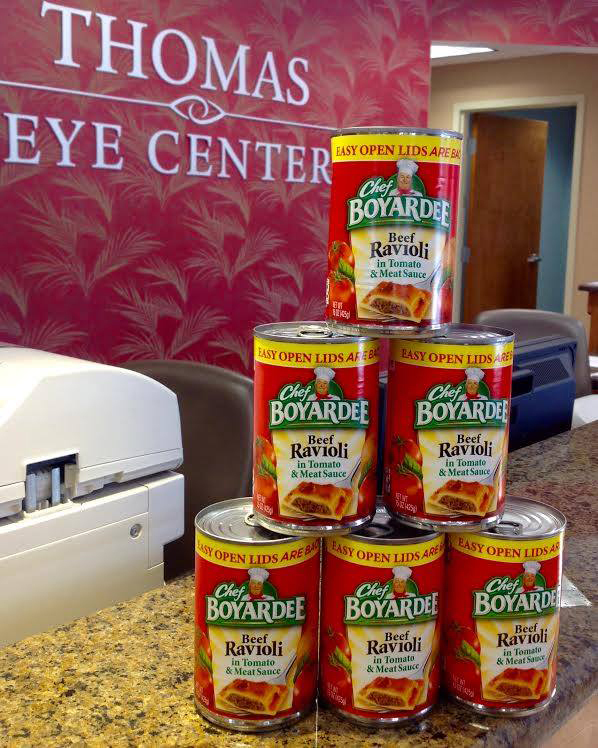 Cans collected in the office of Thomas Eye Center as part of a holiday food drive in which patients who donate four, or more, items get a discount on eyewear. The purpose of this promotion is to help the less fortunate in our area, Athens, Ga., with the added bonus of letting our community know our values. 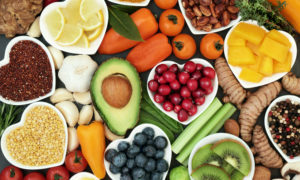 Patients, especially Millennials, want to know the businesses they patron have values that align with their own, so a charity-related promotion during the holiday season can both bring patients into your optical to do a good deed, like donating food, and encourage them to keep visiting yearly for eyecare needs. How it works: After donating four items to the drive, patients are given a discount of as much as 20 percent off eyewear. Cost: Less than $1,000. The money we spend on the discounts will depend on how many patients donate at least four items to the drive. Promote it: We tell people about the food drive when we call to confirm their appointments, and we also post announcements about it on our practice Facebook, Instagram and Twitter accounts. In addition, we feature information about it in our monthly e-newsletter, and also make a note of it on our practice web site. Make it a Success: Staff needs to be engaged in the effort, meaning they need to also believe in the mission of the charity you are supporting, so they will be excited to talk to patients about it, answer their questions and encourage donations. 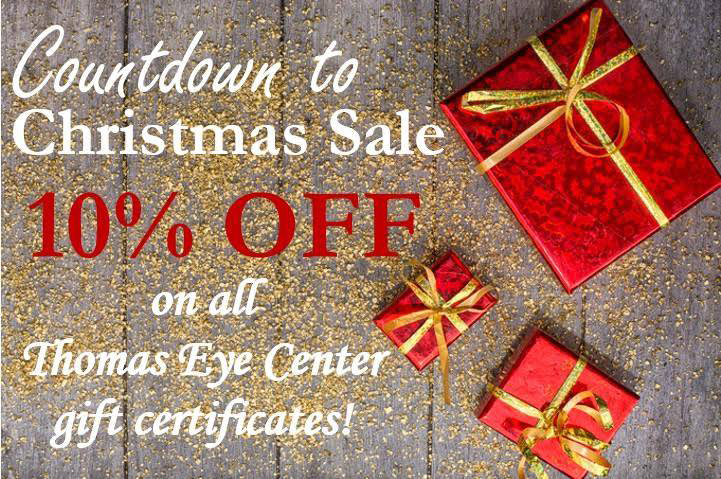 Thomas Eye Center offers a 30-percent-off sale around the holidays. The promotion makes it easier for patients to get the products Dr. Thomas prescribes, and it contributes to end-of-year revenue growth. 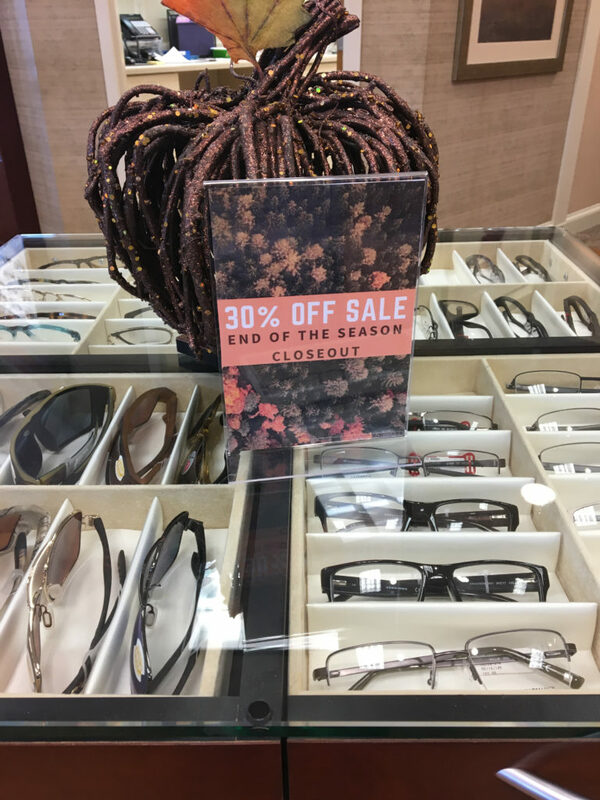 This promotion, starting after Thanksgiving, offers 30 percent off select frames–those we want to sell to make room for new merchandise for the new year. Our hope is that patients use these frames as a second-pair purchase of sunglasses, or for a pair of back-up glasses. How it works: We let every patient who visits our practice know about the sale, especially those who have been prescribed multiple pairs of eyewear by the doctor. The frames are grouped together in a particular area in our optical with signage, so we point out where the patient should look if they don’t ask about it on their own while browsing. Cost: No additional cost since the products have already been purchased, and have not yet sold. So, we can only gain at this point in the year by finally selling them. Promote it: In addition to doctor and staff talking to patients about it as an opportunity to have glasses for all the needs in their life, from driving, to sports, to computer work, the clearance sale should be announced on all of a practice’s online sites–practice web site and all social media pages. You also can let patients know via e-blasts and e-newsletters. Make it a Success: Doctor-driven dispensing is key to this promotion, as the patient has to understand why they would want any more than just one pair of glasses. If the doctor can explain the benefits of additional pairs of glasses, and then mention the end-of-year sale, the patient is more likely to take advantage of the discounted eyewear. When patients buy one pair, the second set of lenses are half price. During December they get an additional 20 percent off of the frame – even close outs. We need to move the frames that are dead weight, and taking up valuable real estate. Offering the lens discount, and giving the patient the ability to combine that discount with a discount on frames, gives less excuse not to buy. How it works: We run the half-off second pair all the time – the additional 20 percent off, which we are offering this holiday season for the first time, hopefully will move some slow-selling frames. Cost: No added cost, as no merchandise was especially purchased for this program. Promote it: We have the frames displayed in a particular floor case with signage, along with promoting the sale online on the practice web site, social media accounts, e-blasts to patients and in the e-newsletter. Make it a Success: Success boils down to employees taking ownership of the sales promotions and educating patients about them. An incentive program, in which opticians receive a bonus based on sales on an individual, or team, basis, can help. An ad posted in the office and online, advertising the holiday gift card promotion that Thomas Eye Center offers. It’s the holiday season, with patients searching for the perfect gift–something friends and family don’t have. A gift certificate to an optical, where they can finally buy that pair of designer frames, or sunwear, they always wanted, may be just the thing for the tough person on their holiday shopping list. So much the better if the giver of the gift card gets a discount on the gift card, or a discount on a pair of eyewear for themselves. How it works: The way we do this promotion is by offering 10 percent off gift cards. If a patients buys a $200 gift certificate, they only pay $180, or they can opt for the recipient to have the additional 20 percent, and they would receive a gift certificate for $220. Cost: The 10 percent difference between what the buyer pays and the recipient receives. Promote It: We dress up a fancy embossed envelope and display at our check-out counter. We also post social media and practice web site shout-outs about it, and display our gift certificates under glass tabletops in our optical. Make it a Success: Even if you have promoted the gift card discount program in multiple ways electronically ahead of their appointment, and mentioned it during their office visit, the patient still needs to be reminded of it when they are at the check-out counter.